Gilles Nuytens: Hello Mitchell, how are you ? Could you tell us a bit about yourself, who you are, what leads you in your career, personal life ? Mitchell Kosterman: Hello, Gilles. I am doing well. I hope you are well also. I was born and raised in and around Vancouver, British Columbia, Canada. I am married and I have three children. I have worked in many different jobs. I was a Corrections Officer for five years and an Investigator for the British Columbia Attorney General for nearly 15 years. I started acting in 1987. I am 47 years old. My first job was on the series Wiseguy and I have worked on more than 120 shows since. I have been writing for years and it is my ambition to get one of my screenplays made into a movie some day. At home I am renovating our house and I enjoying learning about carpentry, plumbing, etc. Gilles Nuytens: The roles you play are often "cop-oriented" ones or authority representatives, is it a personal choice or is it opportunities that come to you ? If it's a personnal choice, why this choice ? Mitchell Kosterman: These are the opportunities that come to me. But I love doing them. I believe I have played more cops than any actor I have ever known and I like being able to say that. I have a new agent and when she first started to represent me we had a long talk about where my career should go. One of the things we talked about was trying to do more than just cop stuff. She wanted me to put a lot of energy into trying to get out of the cop roles and into something else. I did try but she soon realized something I have known for years: the industry sees me a certain way and it may not be worth fighting that. The auditions I get to read are mostly cop roles but I like doing the cop roles. I feel very comfortable doing them and people tell me I do a good job. How can that be a bad thing? 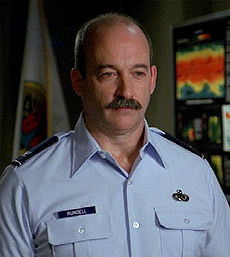 Gilles Nuytens: You portrayed the role of Colonel Tom Rundell in 2 episodes of Stargate, 2 episodes very different from the usual episodes in the show in terms of realization but also in terms of emotion; Heroes - Part 2 was certainly one of the saddest episode from the whole show. How did you approach this character ? Mitchell Kosterman: I wanted Tom to be a really good guy. A guy everybody trusts. I was hoping people would think, "Hey, he looks like he'd be a good friend". At the same time I wanted to look strong enough to be a Colonel in the US Air Force. A guy the General could rely on. I was told the Air Force I made a pretty good Air Force Colonel..except no-one in the US Air Force is allowed a moustache. What I have never said before to anyone is: I modeled the attitude of Tom Rundell on Director Andy Mikita. Andy is very calm, capable and likeable. I wanted Rundell to be like that. I am sure Andy would be surprised to hear that. Rundell was, of course, different from Andy in many ways. Rundell was stiffer, more military, and I was very much aware of that, but I wanted to try to find a way to be in charge but not officious, the way Andy is. Andy is the boss on set, there is no doubt about that, but everyone feels comfortable around him and that atmosphere allows for a very friendly and cooperative atmosphere. Gilles Nuytens: You also played in an episode in the 3rd season of the show, was there any differences to come back 4 years after ? 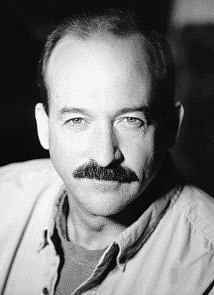 Mitchell Kosterman: The show had matured and some of the staff had changed in season 7. I was glad that Andy Mikita was now directing. I have known Andy since he was an Assistant Director on Macgyver. He is a wonderful person. Michael Greenberg was welcoming, as usual, and he is a very interesting person to talk to. I think Robert Cooper is one of the best writers working in television today. Getting to say Coop's dialogue is always a pleasure. Rick Anderson didn't seem to have changed one bit; still a gentleman. Gilles Nuytens: Will we see you again in Stargate ? Would you like to come back ? Mitchell Kosterman: I would love to come back. In fact, if I had my pick of shows on TV right now, to be a series regular, Stargate would be the one. But it is up to the writers and producers; its not my decision. Stargate, because of the people involved, including all the cast, is a terrific place to work. There honestly is no nicer set to be a part of. And I have been on many. There are no winners, no out-of-control egos, and no "high-maintenance" actors. Each and every person is always friendly and helpful to me every time I am privileged enough to be a part of them. Gilles Nuytens: How could you describe Colonel Tom Rundell ? How close are you with him ? Mitchell Kosterman: I think I described Tom Rundell above fairly well. He is not much like me, actually. I rarely know what to say to people and am not usually confident and in control like he is. I often say things I wish I hadn't and things I say often don't come out the way I want them to. If you listen to the DVD commentaries on Heroes II you will hear Robert Cooper and Andy talking about how I tried to compliment Coop but it came out sounding like something else. Luckily, Coop knew what I meant and he and Andy had a good laugh about it. I always sound more intelligent and confident and in control when someone like Robert Cooper writes my dialogue for me. Too bad he can't follow me around in my day to day life. I'd sound brilliant! Gilles Nuytens: You portrayed the role of sheriff Ethan Miller in Smallville, how was it on the set, what are the differences with the Stargate sets ? Mitchell Kosterman: Stargate has this huge set indoors they use for much of their show, so they don't travel to locations very much. This allows them to be more efficient and things go much smoother. In fact, Stargate is among the fastest crews for shooting. They get many more "set-ups" in a day than other shows. A set-up is each time the camera is moved to a different spot, in case you didn't know. Smallville had many young people on it and that always makes for a more energetic set. Michael and Tom often did impressions of famous actors like Christopher Walken. They were very good at it and they were also very funny. John and Annette were always nice to me. John helped me with acting (he is very professional) and we talked about things we both like. We both do our own home repairs so we would talk about power tools and building decks and stuff. At the time I was racing a rally car and he likes car racing. We had a few things in common and I found him to be a very kind and generous man. Gilles Nuytens: My favourite question: Do you have a funny anecdote you'd like to tell us on the shooting of Stargate? Mitchell Kosterman: I will tell you about one of the most embarrassing things that has ever happened to me. During the shooting of "Seth" the director asked me to pass very close to Rick Anderson while I was talking in one scene. I was concentrating so hard on the dialogue I didn't watch where I was going and I stepped right on Rick's foot. I was mortified. I had just trod on the foot of the lead actor, a producer of the show. But I shouldn't have worried. Rick looked right at me with a twinkle in his eye like he was going to laugh and he said, "Yeowch" very quietly but didn't move or mention it to anyone. Years later, when I went to shoot "Heroes", Andy Mikita was introducing us and Rick said, "Oh yes, Mitch. We are old friends." .and I swear he had that same twinkle in his eye. A very nice man. Gilles Nuytens: Same question but about Smallville ? Mitchell Kosterman: For the episode "Lineage", which was a flashback, I was made up with a hair piece and sideburns. I looked kinda like a bad Elvis Presley impersonator. Due to a miscommunication, the makeup person had put on huge sideburns that she THOUGHT the producer/director Greg Beeman had asked for. But Greg hadn't and when he was shown how they looked on me just before shooting he approved them without really looking. He said later that it had been dark where I was standing and he couldn't really see but he had assumed it would be okay. He told me later he was surprised to see how big the sideburns were once we were getting ready to shoot but, since we were about to shoot, he decided to let it go. He said, he decided it would be okay for Ethan to have silly sideburns; it just made his character more interesting. But Greg admitted it was quite a surprise when he first saw them. He said it looked like I had "a squirrel taped to each cheek". Man, I laughed. Greg is so funny I am sure he was a standup comedian at one time. Gilles Nuytens: Your best memory on the set of Stargate ? Mitchell Kosterman: My best memory of Stargate is sitting and talking to Michael Greenberg about his projects. He has some great ideas and a huge wealth of knowledge. Gilles Nuytens: Your best memory on the set of Smallville ? One was when Greg Beeman told me they were so happy with my work they were going to feature me in an episode. Sadly, due to a snap decision by the series creators, it was also to be my last. That was "Suspect", the episode where I shot Lionel and went off to jail. Another was when, during the shooting of the scene in "Suspect" where I break down I asked Tom Welling to say something nice because that is the way I get myself to cry. I was asking him to help motivate me. He said some really nice things about my work and how sad it was I was going to be leaving the show. He was off camera, but he was there for me. It was great thing he did. A thing a lot of other actors wouldn't have time for, especially when they are the star of the show. Tom was there for me and I will never forget it. Another happy memory was when I got my chair. Regular cast get canvas backed chairs with their name embroidered on them. They are not for "day players" such as myself. I was surprised and delighted when, in the early part of the second season, I got my own chair with my name on it. I still have it at home because they gave it to me when I left the show. It was a nice thing for them to do and it reflects the generous nature of the crew. Gilles Nuytens: Do you think it's important for an actor to watch the result of his work on screen ? I know that some actors do watch them and some don't, do you ? Mitchell Kosterman: I always do. But I understand why people don't, because I am never happy with it. It is often painful to watch. But I do find I learn things by making myself watch. Gilles Nuytens: Which is THE ROLE of your life, the one you want to play at all cost and even play voluntary ? Mitchell Kosterman: Oh, I don't think I can answer that without embarrassing my self. Suffice it to say, any role I covet would be one I am now too old to play. Mitchell Kosterman: Sherrif Ethan. I would have been happy to play that role forever. In many ways I invented him. Even though I only had a few lines in the show in the early episodes, I managed to create a character out of it. You may say, "but the character was written". In fact, it was not. It was just a series of appearances by a deputy with no name. I had to fight to establish a name. If you look closely at the early episodes you will see my name tag says "Talbot". John helped me by establishing my name when, in the episode "Rogue", he greeted me as "Ethan". It is interesting to note, on that day, I had a name tag that said "Ethan" because the props person couldn't find the "Talbot" one I asked her for. I kept calling myself Ethan Talbot and eventually the Ethan stuck. The website writer who wrote the fake newspaper for Smallville named me Sherrif Ethan Miller in several articles and from then on, that was my name. The earlier scripts all called my character "deputy" and it wasn't until some time into the show that the scripts actually started saying "Ethan". This was important because I played Ethan. If the script still had said deputy, they wouldn't have put me in the episode. Because the character in early scripts was often a different deputy with no real character, and I was just kind of put in to be a familiar face, the dialogue for me was often written in such a way that it conflicted with earlier characterizations. I decided early on that I would build the character and change the dialogue to suit me. I was taking a risk because I often said very different things than what was written. But I was always careful to remain true to the story while staying true to my character. I made some choices that endured throughout the two seasons. For example, I decided to make Jonathan my old buddy from school. I figured we were about the same age and likely had live in Smallville all our lives, so we would pretty much have to know each other well. John agreed. In the end they even used old highschool photos of John and myself playing football together. Things just worked out very well. .until I shot Lionel, of course. Gilles Nuytens: Which models have influenced your career ? Mitchell Kosterman: There are many. You can learn something from ever veteran actor but some of the ones I most relate to are Gene Hackman, Edward Woodward, Ron Pearlman, Dennis Farina and Lance Henrikson. 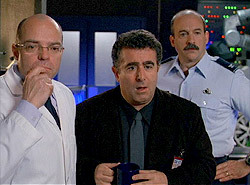 Gilles Nuytens: How was it to play with Saul Rubinek, what kind of person is he ? Mitchell Kosterman: He is a hyperactive, hard working, extremely talented man who knows as much about film making as anyone on set. He is a big part of the reason Heroes is so good. Gilles Nuytens: It happens often in the industry that an actor or actress is chosen for his notoriety, even for his/her "plastic", what is commercially an undeniable asset, instead of an actor that better fits the role. What do you think ? Mitchell Kosterman: It is too bad because I think the audiences would prefer the good actor. But I understand how star power gets movies made and sells movies. I think the system of movie making is set up in such a way that it's just plain easier to make a movie with famous people in them regardless of whether or not they can act. That makes for some bad movies but, hey, I'm just happy I get to work as an actor some times. It is a privilege and I love doing it. I will always do my best and I am very happy when someone likes what I do. And I am no judge of whether or not I am good at it. You are. Mitchell Kosterman: I am reading and meeting directors and producers for some new TV series that are shooting in Vancouver. You probably haven't heard of them and some of them won't even get made. But, I'm really looking forward to doing something fresh and meeting some new people. I am also auditioning for several feature films shooting here. And I'm told there is a sequel to White Noise in the works. Of course, if Stargate or Smallville calls.I'll come running. Gilles Nuytens: A big thanks for this interview, I hope to see you again in Stargate very soon! Mitchell Kosterman: I am honoured you asked. Good luck with your website and thanks for watching.